At My-Betta-Fish.com, we firmly believe that your shopping experience should be convenient, fun, but even more importantly it must be safe. While viewing or shopping on our site you can rest assured that we have your security in mind. We use the most advanced SSL encryption technology available on our e-store to keep your credit information safe. You can also be confident that we will continually adapt our system as this technology changes. The technology we use makes your credit information unreadable as it travels from your computer to our e-store. Your credit information is then stored in a database on a server that is not connected to the internet. We value your business and have taken every possible step to make your shopping experience safe. 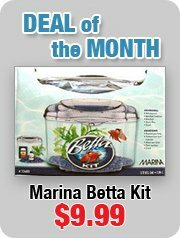 All these aspects of our online security give us the confidence to back every one of your purchases at My-Betta-Fish.com with our Safe-shopping guarantee! If you have any questions about the safety of your online shopping experience or your privacy while browsing our site, please feel free to contact us.